Seravezza is a delightful village in the province ofLucca which is part of Versilia, close to the towns of Forte dei Marmi, Stazzema and Pietrasanta. 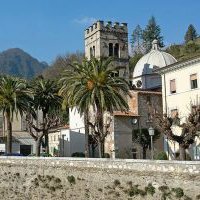 Its territory includes villages that are located between the mountain area, the valley and the countryside, among which we highlight Azzano, Cerreta Sant’Antonio and Querceta. The village of Seravezza, known before the medieval times as "Sala Vetita", was born at the confluence of the two rivers Serra and Vezza, which give life to the river Versilia. In the Middle Ages, its history is linked to the history of the families of Corvaia and Vallecchia and to their wars against noble families of Lucca. The most interesting monument in Seravezza is the Medici Palace, a wonderful building recognized in 2013 by UNESCO as a World Heritage Site. The building is home to the City Library named for the writer Sirio Giannini, and home to the Museum of Work and Popular Traditions of Historical Versilia, where more than two thousand articles are collected, dating from the late eighteenth century and the mid-twentieth century, witnessing agricultural production, domestic and mining industries in the area. Other monuments and places of interest in Seravezza are: the Church of St Laurence and Barbara, where stands the Pentecost of Passignano; and the Oratorio della Santissima Annunziata, also called the Oratory of the Madonna del Ponte, which was completely rebuilt after the great flood of 1885.